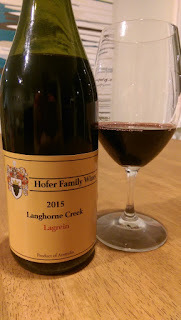 Lagrein is not a variety seen as a flagship for any winemakers in Australia that I know of – not until now. Marcus Hofer of Hofer Family Wines has put a stake firmly in the ground to buck that trend. Focused on Italian varieties out of the Fleurieu Peninsula, Lagrein is his ‘main bag’ as he puts it. Charcoal and lead pencil, lifted purple fruit with some pretty blue flower and violet aromas. Quite moody, plum compote seizes control in the mouth. It's weighty and dense. Firm with a vice like grip, dark chocolate chips away. Oak has some influence - just enough to be seen. A puff of cocoa tannins kicks in before a sapping dryness to close. Slow cooked meals would eat this.